Restricted Countries: United States, UK, Spain, Israel, France & the Netherlands. mBit are one of the oldest BTC casinos and are fully licensed by the laws of Curacao. mBit has been independently tested by RNG and awarded a certificate for fairness. 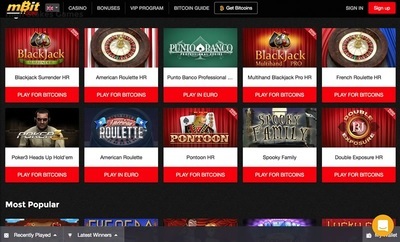 Play hundreds of different BTC casino games from over a dozen leading providers. Live dealer games are available where you can gamble for either bitcoin or euros. Play your favourite slots and table games on any iPhone, Windows Phone or Android. Create an account in seconds with only an email address and start playing instantly. 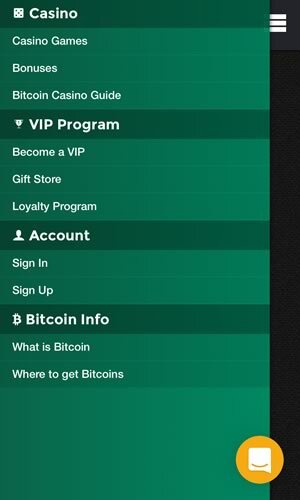 VIP Players earn points that can be redeemed for quality gifts like Ledger Wallets. Make your first crypto deposit at mBit and they'll give you a 110% match bonus. 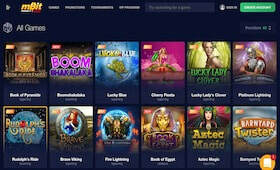 With over 200 games available from seven different providers, mBit Casino offers enough games to guarantee that there is something for everybody. Navigating the expansive list of games is easy; filter either by game type (Dice, Poker, Slots, Roulette, Table Games, Lottery) or by provider, or alternatively search by name if you already have a game in mind. Slot lovers are in luck: choose from 3-line, 5-line and video slots, as well as a number of jackpot games where you can win huge amounts of money for only a fraction of your Bitcoin. You can be confident that all games at mBit Casino are unbiased and offer legitimately fair payout ratios as proven by their independent RNG certificate. mBit Casino boasts some of the most generous bonuses and promotional deals available. New users will receive an industry-leading 110% bonus on their first deposit up to 1 BTC, while second-time depositors still get a 50% bonus and all further deposits will gain an additional 25% free. Your loyalty is rewarded with mBit Casino’s VIP Loyalty Program, where you simply earn points for playing at the site. These points can be redeemed at the store for cash prizes or gift items. There is also a VIP raffle each month where all active players are entered into a lottery draw with the chance of winning an array of prizes. Mobile and tablet devices can be used to play at mBit Casino. No download or installation is necessary, simply visit the site from your browser and start playing. 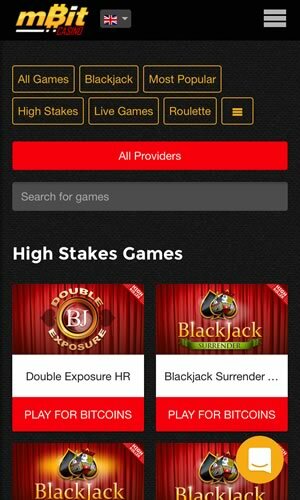 The display is optimised for iOS/Android/Windows Phone and makes appropriate use of landscape mode to give you the best mobile casino experience possible. Menus are easily navigated in much the same way as on a computer, with the only drawback being that live casino games cannot be played from mobile devices – though almost all others can! Registering for an account at mBit casino takes less than a minute: all that is required is a valid email address (a confirmation link will be sent to this address) and a password. No personal details are required so your anonymity is secured. You can start gambling instantly with zero confirmations at mBit. If you want to claim one of the bonuses you will need to wait for 1 confirmation. Payouts are generally processed within a couple of hours and there are zero banking fees. When making a withdrawal to a new bitcoin address, you will be asked to confirm it first via a link sent to your email address. The customer support team at mBit casino are available 24/7, 365 days a year. The best way to get your questions answered is by using the live chat feature found on the homepage of the site that allows you to talk instantly with a member of staff. Alternatively, you can email the support team at support@mbitcasino.com. Two-Factor Authentication can be enabled to keep your bitcoin secure. It is not surprising that mBit Casino is one of the leading bitcoin-only casinos. They are fully licensed and regulated, which can't be said for many of their competitors. They offer hundreds of high-quality casino games that can be played online or on your phone and the bonuses are about the best in the business.